Meathead Movers is here to take care of the heavy lifting for you on your move to Riverbank. Our clean-cut student athlete movers are ready to get you safely settled into your new home. If you are moving to or from anywhere in Riverbank, we are the moving company for you! Our professionally trained student-athlete movers and our moving concierge service are here to help you with every stage of your move. Located in Stanislaus County, Riverbank is a welcoming and scenic town in Central California. Known as the city of action, you can always find something to do- from hitting a few balls with your kids at the Funworks batting cages in nearby Modesto to picking up local produce at the Farmer’s Market. Residents and visitors will love exploring the newly remodeled downtown area or going to the yearly Cheese and Wine Exposition. 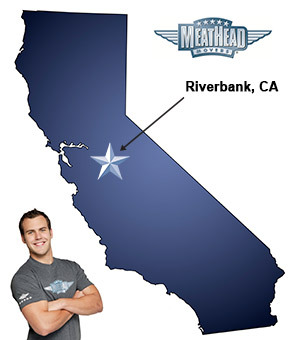 For those looking to move to Riverbank, Meathead Movers is the company for you. Our moving company specializes in local, long-distance, and commercial moves. We also provide reliable packing, storage, on-site relocations, and our distinctive moving concierge service, which connects you with local service providers. All our student-athlete movers are thoroughly screened and trained before their first move. With branches all throughout California, Meathead Movers is a one-stop resource for all your moving needs, from packing to unpacking, no matter where your California move takes you. In fact, you can see what your neighbors have to say about us. With our 100% satisfaction guarantee, the only thing you have to lose is the stress that comes from moving! So contact us today for a free no-obligation moving quote and to learn how we can help you on your next move! Moving to Riverbank? Here are some helpful resources. The guys worked hard but also took care with my items. They asked questions instead of making assumptions. I was impressed by how efficient the entire moving process was; from making the reservations to the actual move. I will definitely use Meathead Movers again and recommend the company to others. The crew was very friendly and very organized. They did a GREAT job! !